If proponents of increased investment in transit are convinced of the development-spurring potential of new rail or bus lines, the opposite is also true: New development promotes more transit use. Several transit-minded regions, notably the San Francisco Bay Area, have capitalized on the ability of public transportation to draw people in and have encouraged developers to construct new residential and commercial properties near stations. But Maryland’s recent announcement that it will be locating state offices and providing development incentives in areas near transit lines may be the start of a nationwide movement to promote transit-oriented development (TOD). Governor Martin O’Malley (D) made the declaration last week near a Metrorail station in Prince George’s County in the Washington suburbs. His administration will move the headquarters of the state Department of Housing and Community Development and its three hundred jobs to this historically economically under-performing county. Prince George’s, despite being the second largest county by population in the state, has never hosted the head offices of any state agency. 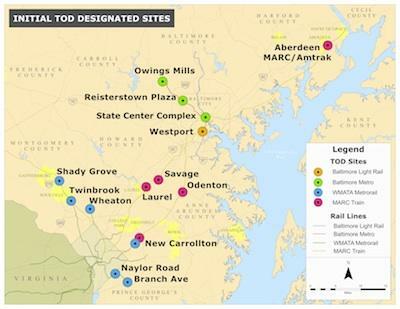 Fourteen stations statewide will receive preferential treatment from the Maryland Economic Development Corporation, get priority for new state offices, and get assistance in related infrastructure upgrades. All new construction must be built within a half-mile of each respective station, generally considered the maximum comfortable walking distance for the average individual. The stations picked are on the Washington Metrorail, MARC Commuter Train, and Baltimore Metro and Light Rail systems. Developments are supposed to be mixed-use in nature to allow locals to be able to walk to and from work, home, entertainment, and shopping. Maryland’s move, which isn’t likely to spur a massive or sudden impulse to build, nonetheless sends a good signal about the importance of building in the environs of transit, a policy that allows people to get around with more vehicles than their private automobiles alone. And it comes in opposition to recent trends that have seen many government offices exiles to far-off locales completely cut off from anything but the nearest highways. In its base closures and relocations, the U.S. Military has specifically chosen to move soldiers and civilian employees from transit-friendly areas to places further out into the suburbs. In the Washington region, the movement of hospital facilities out of Walter Reed Army Medical Center in the District of Columbia and towards expanded bases far from downtown exemplifies that problem directly. It would be more effective, of course, to simply mandate most new construction to take place near transit stations, but it would be difficult to ever pass such a requirement into the law. Maryland’s legislation, which helps the state government make sound decisions about office locations and encourages the private sector to do the same, may be the best approach for now.